Dubai: Two whale sharks have been sighted in two different ports in Dubai and Abu Dhabi. Marine environmentalists came together yesterday to assess the health of a whale shark which lost its way and has ended up in Ghantoot Marina near Abu Dhabi. 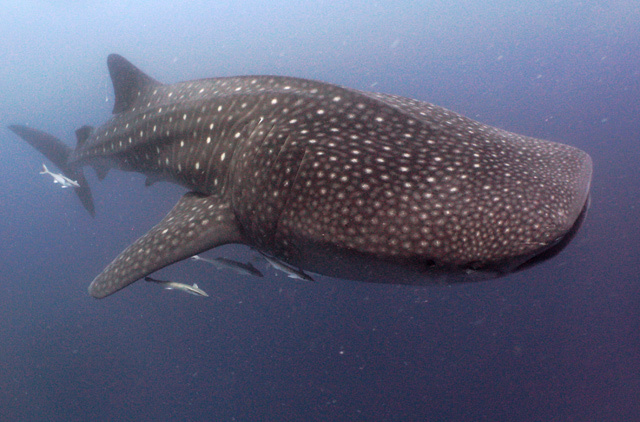 A satellite tag will be attached to the whale shark if it is suitable for tagging. The tag has been sponsored by Le Meridien Al Aqah. "We don't know if it is a male or a female, or if it even needs our help at this stage," said David Robinson, a PhD student studying whale sharks. Robinson also heads the Shark Watch Arabia project in the UAE that is compiling a database of whale shark sightings in the region. "The satellite tag sponsored by Le Meridien Al Aqah was planned to be used on a whale shark on the East Coast but now we may use it on this whale shark," said Robinson. A second whale shark has also been seen swimming around Al Hamriyah Port near Deira. "It's quite unusual to have two whale sharks in ports at the same time. We don't know if they are trapped or if they followed some plankton and are feeding," said Robinson. "During the day they dive deep to avoid the heat and only come up in the early evening when it cools to feed," he said. Robinson said the main risk to the whale sharks is boat traffic. "I'm going to jump in with a mask, snorkel and camera to identify if it's a male or a female and if it's feeding," he said. "It might not need our help to leave the port at all, and our interfering could just stress it out. If it's female and healthy then we might deploy the tag on this one," he said. So far all that is known about the whale shark in Ghantoot Marina is that it measures between 5 and 6 metres. The animal in Al Hamriyah port was reported last week but access to the site is restricted. Ebrahim Al Zu'bi, executive director of Emirates Diving Association said the group is trying to raise money to purchase a second pop-up satellite tag to eventually tag both sharks. "This will be the first tag deployed on a whale shark between EDA and the Shark Watch Arabia project. We have devised a rescue plan but hopefully it will find its own way out," he said. The rescue of marine mammals will be the subject of a lecture given tomorrow night by two marine mammal rescue trainers from the organisation, British Divers Marine Life Rescue. Listen to a lecture on the rescue of dolphins, whales, dugongs.